The Thermo Sorvall ST16R refrigerated centrifuge fulfills multiple centrifugation needs, from general purpose sample preparation, to temperature-controlled cell culturing as well as clinical applications. This benchtop centrifuge is simple to operate, with intuitive digital controls, and rotors that can be removed with the push of a button. The motorized lid latch of this refrigerated centrifuge means one finger closing and makes this convenient to place in your lab. When rotors are changed in the ST16R, SMARTSpin technology identifies the rotor automatically and sets rotor limits, eliminating potential for error and improving separations. 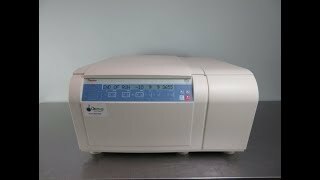 The Thermo Sorvall Centrifuge ST16R comes preset with 9 accelerations and 10 deceleration protocols, as well as 6 quick keys for user defined separation programs for frequently used protocols. This benchtop centrifuge also features a built-in timer, up to 9hrs and 99 minutes, with a hold function, a pre-cooling function with direct access button and has a temperature range of -10° to 40°C. This Thermo Sorvall ST16R Centrifuge has been fully inspected and is operating without issue. All of our lab equipment comes backed with our standard warranty. Should you have any questions please don't hesitate to contact us.